As I mentioned in the last eNewsletter, Don Margolis, Phil Satow and I have prepared a Class of 1963 survey in order to get some feedback from all of you about why you have, or have not, been supporting Columbia College. We are in the final process of analyzing these, and will post the results here soon. Check back in a week or two. Summer is reaching a steamy climax as I write these notes. I have received some very long, and interesting notes from you recently, and include some of them here intact. If this is your first visit here, I've added a link to an archives page, which in turn, will link you to the past issues of the Class of 1963 eNewsletter. If you haven't seen any of the earlier newsletters, take a look -- there's a lot more news, pictures, and interesting articles than I haven't been able to include in Columbia College Today. Please join your classmates for an informal lunch at the Columbia Club every second Thursday of the month. It is our hope that these gatherings will renew old friendships and foster improved relationship with our class and the College. I hope you can all join us at the next lunches on Thursday, September 10 and October 8. Let me know if you will attend so that we can reserve a big enough table; RSVP to Paul Neshamkin (pauln@helpauthors.com). 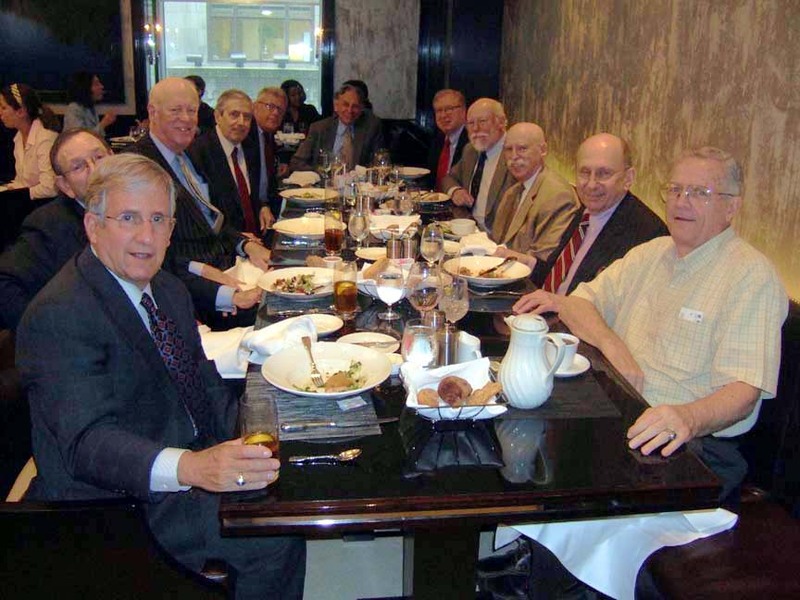 The June 18, 2009 lunch (the last of the summer) brought together a record group of '63ers with 11 classmates attended. Among the regulars attending were Joe Applebaum, Steve Barcan, Henry Black, Doron Gopstein, Bob Heller, Paul Neshamkin, Larry Neuman, Tom O'Connor, Jeff Thompson, and Ben Tua. Chuck Miller joined us for his first class of '63 lunch. (Seated from left to right) Steve Barcan, Bob Heller, Jeff Thompson, Doron Gopstein, Ben Tua, Larry Neuman, Joe Applebaum, Paul Neshamkin, , Henry Black, Chuck Miller, and Tom O'Connor. Click here to see some candids of the group. Don Margolis and I went to the College Convocation ceremony at the end of August. We were there to welcome the class of 2013 start their first academic year, and hear Michele Moody-Adams, the new Dean of Columbia College. Our class, having graduated 50 years before the entering class, will start to take part in the “Bridge Program” (formerly called the “Grandfather Program”), which will give us all an opportunity to build a closer relationship with the class – starting with this event, and through to their Commencement in four years (which will also be our 50th Reunion). George Violin sends this report, "For those who remember me, I thought I would add an update on my life since college. After graduation I went to P.&S. graduating in '67 after spending a year as an international fellow at what is now SIPA. I had always been interested in politics and found it to be a wonderful experience. Nobel Laureate Harold Varmus P.&S. '66 was there at the same time. I subsequently went on to do research at the Communicable Disease Center (now Center for Disease Control) in Atlanta. Returning to Boston, I finished a residency in ophthalmology in'73 and entered private practice. After leaving residency, I married Joan Gambill, Mt. Holyoke '70 who worked at a lab at Mass. General. We have three grown children: Jon, a PhD. MBA who is a biotech scientist and entrepreneur, Steven an MBA and CFA who manages money, and Sally an MBA who works in health care informatics. They, and Joan are all equestrians, and chose to go to college at Duke (Jon and Sally) and Colgate (Steve) where their horses could follow them. I believe I have the distinction of being the only one in my circle of friends, whose children went to business school on someone else's nickel! Along the way, I pursued parallel careers in real estate speculation and most recently surgery center development. I was one of the founders of Ambulatory Surgery Centers of America, the largest privately held company in the industry. I have been active in the nonprofit sphere, on a national level with AIPAC,CAMERA, and Mideast Forum, founded by Professor Daniel Pipes. 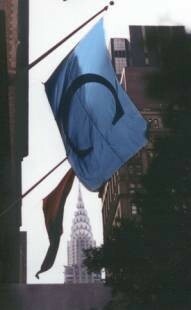 At Columbia,I have donated two full professorships. The first in Core Curriculum occupied by Gareth Williams from the Classics department. The second in Molecular Cardiology occupied by the University Professor Wayne Hendrickson. I have also donated a college scholarship in honor of my parents, Mary and Sigmund Violin, as well as a travelling fellowship to Israel. I was guided in these matters by the memory of my father, a lawyer in Vienna, a dishwasher and insurance broker in the United States. He alone of his family was not exterminated by Hitler. He taught me to revere the Classics and to pay my dues, in this case to Columbia. Which brings me, with revulsion and sadness to the Massad abomination. I have followed this for several years through Campus Watch and Mideast Forum with Professor Pipes. He was denied tenure once.It does not surprise me that under cover of darkness, lead by Professor Dirks, the University reversed itself to grant an annuity to this mediocre scholar, homophobe, and Israel hater. The story here is not about Jews or even Israel, but about the hatred of America and Western values in politically correct academic circles. The public discourse here is inevitably pretextual, as is of course the discourse about ROTC etc. Those who feel as I do, have no choice but to turn off the financial spigot, until the inmates no longer run the asylum. Fortunately the hard sciences and the medical school still have their integrity. I see a few of my classmates now and then, most recently Gary Rachelefsky. I remain in regular contact with Gil Einstein. Would be happy to see more of you." George, we would love to see you, and talk further about the implications of the Massad tenure decision. Many of your classmates have expressed their feelings in email discussions with me. I for one, will continue to support Columbia College. I will however, make sure that they know of the concerns of many of our classmates. Frank Sypher wrote to say, "just published is Liber A 1628-1700 of the Collegiate Churches of New York, edited and translated by Francis J. Sypher, Jr.: Grand Rapids, Michigan, and Cambridge, U.K.: William B. Eerdmans Company, 2009; pp. lxviii + 374. No. 62 in the Historical Series of the Reformed Church in America, in cooperation with the Collegiate Churches. Liber A, written mostly in Dutch, and here presented in the full original Dutch text, with facing English translation, contains detailed 17th-century records of the Reformed Protestant Dutch Church of the City of New York, including correspondence, texts of legal documents, and lists of names of consistory members. Especially significant are records pertaining to the granting in 1696 of the royal charter of incorporation of the Church, and records relating to donations for, and construction of the church building on Garden Street (now Exchange Place). Nearly all of these pages were written out in the late 1600s by Domine Henricus Selijns (1636-1701). The records are here presented with a detailed historical introduction; detailed notes about historical persons and events; and an index. The full Dutch texts have never before been published, and they should be of interest to all concerned with American colonial history, especially the history of New Netherland and New York." Steven Cahn writes, "I'm pleased to report that two of my former doctoral advisees, now faculty members, recently edited a book of new essays written for the volume by former students and colleagues of mine. The work is titled A Teacher's Life: Essays for Steven M. Cahn (Lanham, MD: Lexington Books, 2009)." There is a recent article in the National Review (August 10, 2009) entitled “Brainy Bronx Kid against Terror - A conversation with Judge Michael B. Mukasey, George W. Bush's last attorney general.” It starts, “Michael Mukasey is a modest man, not a horn-tooter, and you may have missed his tenure as attorney general.” I’m sure none of you did, but you can read the entire article here to learn more. Michael Hassan writes, "This is a transformational year for me. I have spent 7 years now with my furniture in storage, traveling around the world enjoying my unfettered and somewhat unconventional lifestyle. I began this year determined to settle down. Here is a brief look into what is probably quite a different lifestyle than most of my classmates with, I would say, the main difference being that I have been living as a single male for the last 36 years where most have been married......just two different paths through the woods, generating quite different experiences and philosophies to match. I'm right now in the process of closing the sale of my Buenos Aires apartment and have been struggling for two months to fulfill what appear to be nonsensical bureaucratic hurdles but that must have been designed by someone to piss one off and simultaneously nab as much of one's hard earned money as possible. Nonsensical in the process but the endgame was of course clearly in sight in that I paid taxes where none should be due; e.g., through what I have been calling a Fascist Fiscal law, they determined that I had phantom rental income. Once they dragged me kicking and screaming through that bit of boondogglery they then were able to charge me a non-fictional 21% tax on a fictitious amount of rent during fictitious months of rental and the coup de grace, all penalized with interest going back 3 years.....this while being insulted, ignored, barely tolerated, shunted about and forced to crisscross the city for certifications upon certifications, all proving and documenting what never happened. AN ASIDE: The tax bureau here is quite interesting. You may know that during WWII, even though Argentina was neutral, there were a lot of Nazi sympathizers including the President at that time. It seems a relic of that fascist attitude has trickled down and nestled solidly in the Fiscal tax laws. THEM: "You left the country 14 months since you owned this here apartment and hence, you must have rented the apartment while you were gone." (all this in Spanish). ME: "Never rented, not one single day of income. But while I was gone, I left my girlfriend here to mind things and you can look at her passport to prove it. She lives with me." THEM: "Nope, only a marriage certificate will do, we don't recognize girlfriends, gay friends, free giving to other friends, etc." So I paid it and moved on ....a tough pill to swallow but since there is no capital gains tax, I still made out better here than in the USA and with a modicum of appreciation to soften the blow. Once I close the sale, which I expect to be near the end of August, I am off to Cabo San Lucas, Mexico where I have rented a beautiful but small villa, pool and hot tub included, a scant 100 meters from a Pacific ocean, golden sand, long beach leading to the famous, Cabo San Lucas, marina. I am able to take nice long, early morning walks before it gets too hot, plunging into the pool directly after. All this before coffee ....imagine! Due to some costly yet propitious delays, I will have endlessly beautiful weather from May when I joined Bill Campbell, my brother, %%, and the rest of the Ivy League football Champs in NYC for our annual golf bash, through June (when I drove my vintage Sebring convertible from Los Angeles to Cabo San Lucas), through 2 months of what they call winter here in Buenos Aires (but what I call splendid walking weather), until I finish up the year, in high spirits, in high season, in Cabo. Yes, I poo pooed the bird flu (Doctor Bob Lincoln said it was all hype and he was right), drug killings, road pirates and headed on down without a hitch other than breaking the rear window on my convertible. (I was so excited by the morning weather when I hit the Sea of Cortez that I tried to put the top down with a favorite painting sticking up out of the boot.) Broken glass, splintered painting frame but en realidad, no problema. Does it get any better? Yes, it does since I have finally found a new, seemingly compatible, interesting and quite different girlfriend who has agreed to join me in Mexico for at least 6 months to see if we have the moxie to go "all the way". After 7 years of traveling, I may have attained the main goal of my "transformation", i.e. a partner. I am reservedly but happily optimistic ....either way, there will be many fun and exciting links to add to the chain. 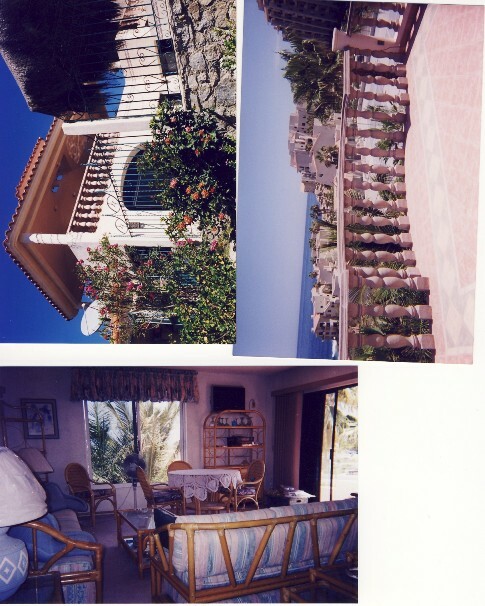 I have attached a photo of the Cabo house that I rented as well as my new girlfriend (she's not from Mexico). "Age is mind over matter...If you don't mind it doesn't matter." Edd Hanzelik writes, " I would like to share that I have co-authored a book, The Inner Game of Stress, which has just been released. My partner, John Horton, and I have been aware of the huge impact that chronic stress has on the health and well being of our patients. Yet the medical field is quite limited in acknowledging this and in its ability to provide effective treatment. We teamed up with Tim Gallwey, the author of the best selling Inner Game of Tennis, to apply his learning methods to the issue of stress. The results have been remarkable. Our patients learn that they can maintain their inner stability in the face of life’s challenges. The tools we provide are simple. Yet they help people see they have a choice when it comes to stress. On a personal note, I’m living in Calabasas, California, a suburb of LA. My family is growing. I know many of us have grandchildren (I have two). We also have a one year old great grand-daughter! Quite a delight to be with. My wife and I enjoyed the 45th Reunion of our class, the first we had attended. Walking around the Columbia campus and meeting classmates brought back many fond memories." Alexis Levitin writes, I am just this moment back from Ecuador where my newest book was launched on August 5th. The book, Tapestry of the Sun, is a co-translation with Fernando Iturburu of eighteen different modern Ecuadorian poets. It is the first anthology of Ecuadorian poetry ever published in English. While doing all that work, I also managed to spend an entire month on the beaches of the Galapagos Islands, taking long walks among the marine iguanas and swimming clumsily with lithe young sea lions to their endless amusement. My other book this year is called A Traveler's Literary Companion to Brazil (Whereabouts Press). It is a collection of short stories representing all the regions of that vast country. I was the editor of the project and also translated four or five of the stories. The book should be out in October. I continue to enjoy my translation-related travels to Brazil and Ecuador and try to take a break here and there to plod through rainforests looking for monkeys and have the rare fortune to gaze with profound pleasure at a bay filled with sleek dolphins. Still teaching at SUNY-Plattsburgh, for the nonce." Gary Rachelefsky reports, "Gail and I had our sixth grandchild Jocelyn Rachel Weinstock on may 13th . The happy parents Lindsay CC 2001 and Daniel Weinstock are both doing well as is Jocelyn. Gail and I will be going to Singapore and then on to Nepal in October. In our group is one of our classmates Charlie Goldsmith and his wife Maryanne a graduate of Barnard 63. We had dinner with Bobbie and Amy Heller recently. I enjoyed visiting with Peter and Eileen Broido last month in Chicago All are NOT aging. Chet Osborn writes, "I just returned from my 50'th high school reunion in Monticello, NY. It was my first one and it was a pleasant surprise to see old friends. 30/107 have passed away. I miss surgery, having retired from thoracic/CV surgical practice in Columbus, OH a couple of years ago. I keep busy with 2 granddaughters and travelling between the Smokies in the summer and Kiawah Island in the winter. Richard Tuerk & I still keep in touch. I enjoy reading the Class Notes and appreciate your efforts on our behalf." Howard Freese the following, "Here are a few shots from "Sans Souci" in North Carolina. 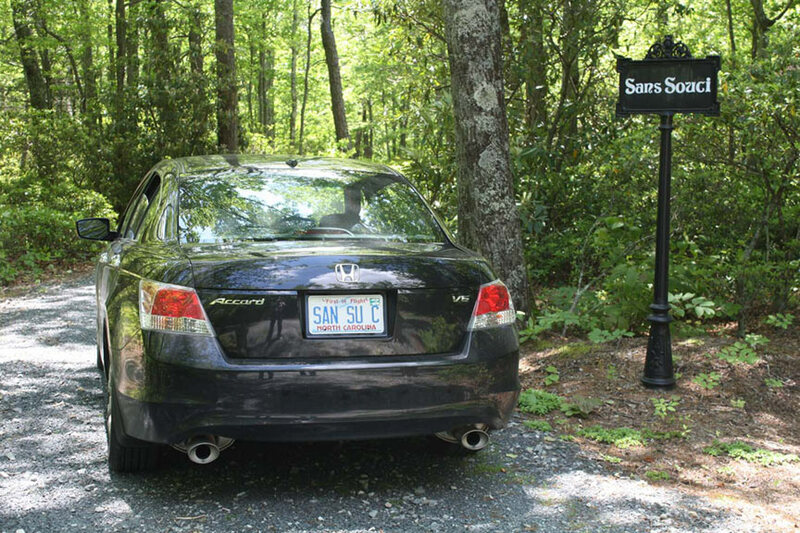 The fun one that may make some sense to CC 63'ers is the one of the license plate "SAN SU C". Gonna be on this property all next week enjoying the summer breeze in the NC mountains." a) In April 2009, I was selected as an inaugural member of my university’s Master Teacher’s Guild. b) A paper in JAMA for which I was senior author, “Medical students’ exposure to and attitudes about drug company interactions” (September 7, 2005) was influential in the Association of American Medical Colleges’ developing, in 2008, guidelines for drug company-physician and drug company-student interactions. c) In June, 2008, I married Terrie Lee Stengel, a fifth grade teacher at the Shabonee School in Northbrook, IL. d) I keep closely in touch with our ’63 classmates Mel Gurtov, my Phi Ep roommate (now a professor of Asian political affairs in Oregon), and Bob Peters, my roommate at the Chicago Medical School, now a professor of Medicine (Cardiology) at the University of Maryland." Larry Neuman sends the following update on his alternate energy efforts, "I now represent “the wind company” (that is its name) for North America www.thewindcompany.at (see my pic). twc is based in Vienna, Austria and I am working with them on a number of utility-scale wind farm acquisitions in the United States from Illinois and Minnesota to Texas. We are now working on a solar project in China (in addition to wind) and we (Solar Bridge) www.solar-bridge.com are about to build our first solar project in New Jersey (from Inner Mongolia to Hackensack and anyplace in between – that’s my motto)." Richard Eisenberg, the Tracy H. Harris Professor of Chemistry at the University of Rochester has been named a Fellow of the American Chemical Society (ACS). I received the following information in the University's press release. "Eisenberg has contributed to the education of hundreds of chemists through his efforts at the University, and has served the community as chairman of the Gordon Research Conference on Organometallic Chemistry, as chair of the American Chemical Society Inorganic Chemistry Division, and as Editor-in-Chief of the American Chemical Society journal Inorganic Chemistry. Some of Eisenberg's work that has earned him this honor involves inorganic photochemistry, chemistry that underlies light-to-chemical energy conversion, and organometallic chemistry related to catalytic reactions done by the chemical industry. His career-long broad research interests have paved the way to important studies in light driven reactions of organometallic complexes toward water conversion to hydrogen, which is the critical transformation required for the development of solar fuel cells. 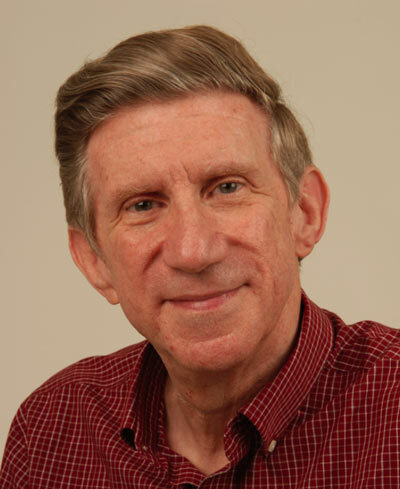 Eisenberg earned his doctoral degree in chemistry from Columbia University in 1967. He joined the University in 1973 and served as chair of the chemistry department from 1991 to 1994. He has been the recipient of numerous awards, including an A. P. Sloan Fellowship (1972-'74) and a Guggenheim Fellowship (1977-'78). More recently, he has been honored with the 2003 ACS Award for Distinguished Service in the Advancement of Inorganic Chemistry, the 2007 Morley Medal presented by the Cleveland ACS Section. He was elected as fellow of the American Association for the Advancement of Science in 2005 and as fellow of the American Academy of Arts and Sciences in 2009. The ACS Fellows Program was created last year to recognize members of the ACS for their outstanding scientific achievements, as well as contributions to the profession, the chemistry community, and the Society." Lee Lownefish writes, Eventful summer Paul - spoke at Major League Baseball's Civil Rights Roundtable in Cincinnati on a panel chaired by Charles Ogletree and that included two Hall of Famers, basketball's Oscar Robertson and baseball's Tony Perez. Also represented Branch Rickey's family when the patriarch was inducted into the College Baseball Hall of Fame in Lubbock TX. (Also inducted Ron Polk, Mississippi State coach who remembers fondly and sends best wishes to our former coach Paul Fernandes. One of Polk's players Rafael Palmeiro also inducted.) Also my first book on baseball's labor wars, The Imperfect Diamond, will be out in a new updated edition in the spring from U of Nebraska Press. Phil Friedman writes, "I am the author of the forthcoming book The Forgiveness Solution: The Whole Body Rx for Finding True Happiness, Abundant Love and Inner Peace (Conari Press, Jan. 2010). See Amazon." You can learn more about Phil's work at www.integrativehelp.com and www.philipfriedman.com. Paul Gorrin writes, "I was a panelist at a local healthcare restructure forum. I was the very skeptical advocate for a single payer system. Lively, thoughtful discussion. Some 200 people were at the Presbyterian church in Lewes, DE. As it was a meeting of a private group (Delaware Small Business Healthcare Coalition), they kept the "crazies" and their signs out. Staffers from Mike Castle and Tom Carper were there. Will send the local paper reportage, which I haven't seen. Among my observations were that I had just come from my office, where I had seen an unemployed couple, newly signed with one of the Medicaid plans, but I couldn't say how many people I DIDN'T see, who stayed way because of not having insurance... Of course I never turn any one away -- but the problem is with diagnostic studies that are very costly. Also: there are in point of fact no uninsured people in the US, as their costs are shifted to those of us who have insurance. I was the maverick. It was a blast to be one of the 'experts'."